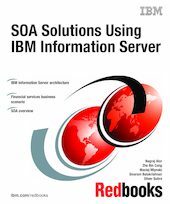 This IBM Redbooks publication provides an overview of IBM Information Server, its architecture, and processing flow. It describes the development and implementation of a financial services business scenario that showcases the Service Oriented Architecture (SOA) capabilities of the IBM Information Server product and WebSphere Integration Developer. It includes details on how a DataStage job, QualityStage job, Federated queries, and DB2 Stored Procedures can be surfaced as an SOA service. It describes the development of applications that consume the services generated by IBM Information Server and WebSphere Integration Developer using Rational Application Developer and Microsoft Visual Studio .NET Professional Edition. It is aimed at an audience of IT architects, Information Management specialists, and Information Integration specialists.